At the KIDS BEATING CANCER PEDIATRIC TRANSPLANT CENTER, Kids Beating Cancer wants children and families to feel at home. We know that a hospital can be a scary place, especially for young children. Kids Beating Cancer has gone out of its way to create a transplant center that is friendly and perhaps even a little fun. Kids Beating Cancer’s “MY ROOM” program provides children ‘safe, fun, and comfort’ during a child’s marrow or stem cell transplant at the Kids Beating Cancer Pediatric Transplant Center (KBCPTC). Kids Beating Cancer funds the Hospital and Lab Costs Never Covered by Medicaid and Insurance to allow any child in need of a transplant and to identify the best possible donor, so every child can access the best medical treatment and the only hope for a cure. Families never receive any Hospital bills for costs Medicaid does not cover! “MEALS FOR FAMILIES” are Kids Beating Cancer Meal Vouchers equal to real money, that are given to families with a child in the Kids Beating Cancer Pediatric Transplant Center to east breakfast, lunch, dinner, and snacks. 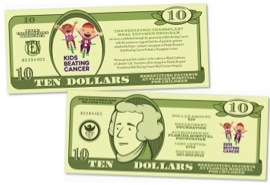 Kids Beating Cancer pays for meals so parents don’t have to worry about having cash in order to eat. Parents can order meals to be delivered to their child’s room from any of the hospital cafeterias or one of the community participating restaurants so they don’t have to leave their child alone in order to eat. When a needed break is desirable, a parent can use the Meal Vouchers at any of the hospital cafeterias. The “Meals for Families” program is not simply providing meals as an end in itself. Research has shown that the entire family complex adds to survival and successful treatment when daily stresses are controlled. Removing the need to worry about where every meal is coming from provides stability and freedom from financial stress for these families going through this tremendously stressful treatment, and actually contributes to the successful outcome for the child. In summary, Kids Beating Cancer is the only 501c3 that funds a series of unique and critically needed programs directed at removing some of the overwhelming burdens placed on families going through the prolonged and difficult treatment process when their child is diagnosed with cancer, leukemia and 80 other life threatening diseases treatable by marrow and stem cell transplantation. Through Kids Beating Cancer’s programs of support, families are able to access bone marrow and stem cell transplants, remain stronger and less overwhelmed with the fear not being able to afford the most basic necessity, food. “Meals for Families” helps parents to stay positive, focused on keeping hope alive, and more able to fight for a cure for their child. Thus, through offering “Meals for Families”, Kids Beating Cancer is able to positively affect and enhance successful outcomes for these very difficult diseases and prolonged treatment programs. When a child needs a bone marrow or stem cell transplant the treatment will require them to be away from the familiarity and comforts of home for many weeks, even months, often causing children to become very homesick. Kids Beating Cancer’s “MY ROOM” program allows each child to put their distinct fingerprint on the place they will be calling home by allowing each child to pick the theme of their hospital room. From sheets and bedding, wall decorations, to toys and accents, the hospital room will be transformed to the “coolest bedroom look” filled with the bright colors of; Minnie Mouse, Disney Princesses to Spiderman, Ninja Turtles, Star Wars or one of many other younger child and teenage preferred themes. The children can then focus on the fun and calming of their theme, softening the look of a very high tech, state of the art Kids Beating Cancer Pediatric Transplant Center hospital room. If you would like to purchase a MY ROOM, call Cecelia Marshall at 407-894-2888 or cc.kidsbeatingcancer@gmail.com.